“Everybody can be great...because anybody can serve. You don't have to have a college degree to serve. You don't have to make your subject and verb agree to serve. You only need a heart full of grace. 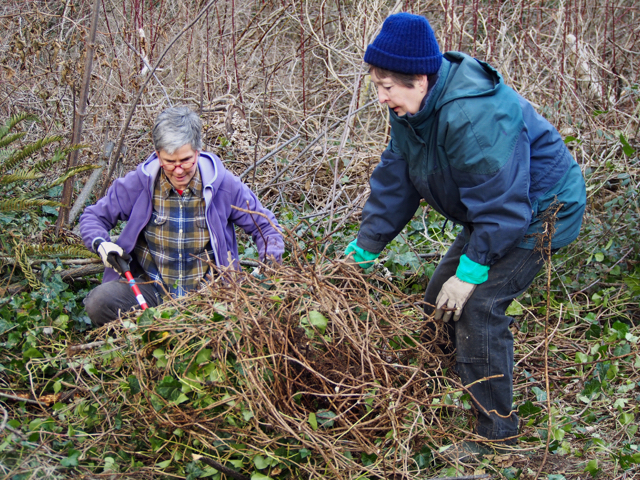 A soul generated by love.” -Dr. Martin Luther King Jr.
Brave volunteers tackling the Himalayan blackberry near the campgrounds. Photo by Wendy Feltham. Every year in January, AmeriCorps members across the country honor Martin Luther King Jr. on his namesake national holiday with a day of service. MLK Day is usually a day off; a day off from school, work, meetings or errands—a long weekend in some regard. However, the legacy of MLK Jr. is one of taking action. That’s why Washington Service Corps and the Port Townsend Marine Science Center (PTMSC) strive to make it a day on, instead of a day off. PTMSC AmeriCorps (from left to right) Juhi, Brooke, Sarah, Mattie. Photo by Wendy Feltham. The AmeriCorps at PTMSC chose to serve the community of Port Townsend by committing to a term of service. The annual MLK Day of Service is meant to recruit others from the community to join us in that duty. 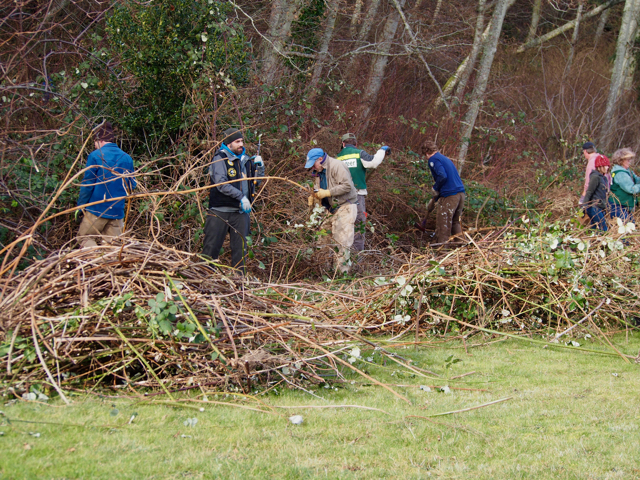 This year marked the 5th annual day of service weed pull at Fort Worden State Park. On January 16th, 2017, we gathered with volunteers who rose to the call to join us in serving our community. A clearing where invasive, pokey, Himalayan blackberry used to be. Not to be confused with trailing blackberry, a native species. This year we targeted the Himalayan blackberry and English ivy that were overrunning the area behind the Natural History Exhibit and campground. These are both quick-growing plants that out-compete the native species vital to the ecosystem at Fort Worden. We gathered at the Natural History Exhibit to identify target areas, gear up, and get to work. Volunteers rolling up the English Ivy like a carpet; the best technique for those pesky vines! Photo by Wendy Feltham. Although we had been prepared for rain to pour on us, somehow it managed to hold off for the weed pull. It was the only thing that held back. Over 50 volunteers showed up, donating a combined total of over 150 hours of service. The outpouring of support was tremendous, and the event an all-around success. dream work! Photos by Carolyn Woods. The weed pull couldn't have been so outstanding without the help of many. Thank you to PTMSC, Friends of Fort Worden, and Washington State Parks for partnering with us on the event. Thanks to the Noxious Weed Board, Native Plant Society, as well as individuals from the Coastal Artillery Museum and Department of Fish and Wildlife and other volunteers who generously donated tools. Thanks to the Fort Worden Rangers and Maintenance team for their continuous support. 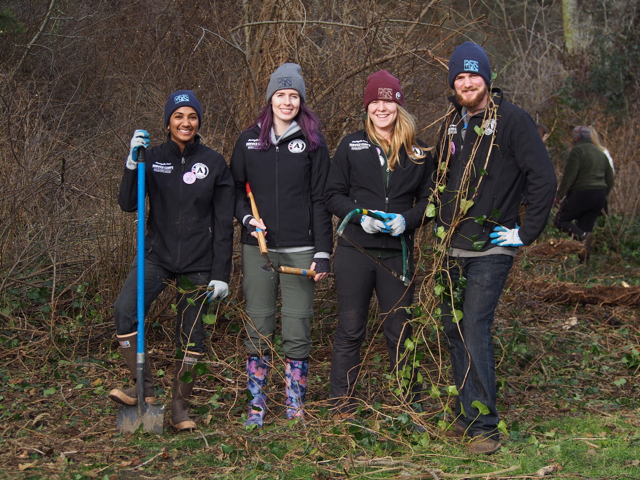 Thanks as well to our Washington Conservation Corps team at Fort Worden and to our fellow AmeriCorps from NOAA Olympic Coast National Marine Sanctuary for joining us in service. I also want to recognize and thank my teammates Sarah, Juhi, and Mattie for their individual and collective efforts in executing the weed pull. We have enormous gratitude for every single volunteer who joined us to honor MLK Jr. by coming together as a community and providing a service to our environment.